EASA’s new Executive Director Patrick Ky says (in the IAOPA Newsletter Nov. 2014) the whole approach to the industry must change, thus saying what the whole industry was pointing out for many years. I believe they can only excel if they are aggressive with the change and if they are determined towards the national CAAs. Currently SERA is an example of the nowhere to be seen “simpler, better” approach towards general aviation. The agency at its best and what The internet calls a facepalm. The agency needs to deliver as soon as possible as it has been talking about a change in many conferences and frequently in social media. As long as there is no actual transformation they run the danger of loosing support from pilots and companies. Presently the Civil Aviation Authorities are working on the implementation of SERA. During the last days it became clear that for example Germany is trying to keep its old rules even though the scope of SERA was exaclty the opposite: the standardisation between European states. 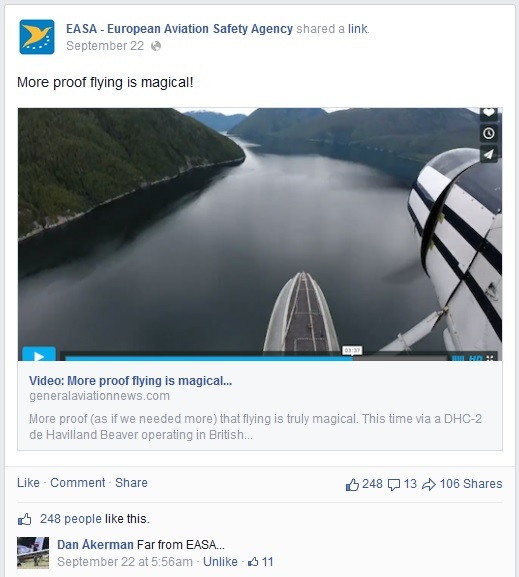 This would be a chance for EASA to step in and lead the CAAs in the right direction and show us that they mean it. Information about how Germany copes with SERA is on the DFS homepage, here. In aviation they say you have to learn from other’s mistakes because you would simply not survive doing them all yourself. The FAA did the same mistake, regulating GA as if they were commercial operators, sixty years ago. It is time for EASA to learn that they can avoid loosing their face by simply looking over the pond and learn from the biggest aviation agency that has gone through a lot of wrong decisions. The FAA has negotiated their regulation with the big US AOPA and therefore, I believe, have the solution for EASAs problems summarized in one book: The FAR/AIM. When I came back to Switzerland after my private pilot training in Seattle I was astonished about the confusion about rules of the air among pilots. As pointed out by a study that I highlighted in the post “Class Delta Confusion”, not even professional pilots in Europe are aware of some rules in certain airspaces. Back then, when I had to learn about the rules in Europe, I wondered why there wasn’t a single book that would give me all the answers. American and European internet forums illustrate this problem. If you ask about airspace rules in America, a pilot will answer with a few quotes from the FARs. If you ask the same in a European forum, there will be a discussion for pages and more confusion than answers.